This is yet a question though! But, now we have few useful solutions for it as we have become more digital now as compared to a few years back. But then some questions come up - How can I do so? Is it worth doing online preparation? Can I trust on these online websites or study material? How much I need to spend? And so on. 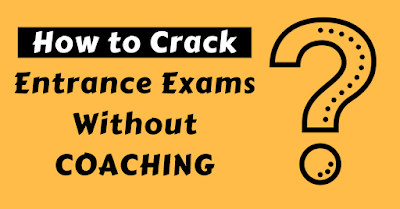 It is now possible to crack any entrance exam if you start your preparation as per below-mentioned steps. Know All About Your Exam - It is important to know as many details as possible about the exam you are going to give. Create a Study Plan - A Study Timetable based on your daily routine and tasks to be completed. Choose the chapters to study in right order. Get your doubts solved online, Notes, tips tricks, etc. Wait for the teacher to give the solution of your doubts, need to take notes, short tips-tricks yourself. Is it worth doing online preparation? Preparing online is now a trend for each and everyone. As said you can access study material anytime & everywhere. How can I trust on these online websites or study material? You can check out students testimonial about the study material here. Also, take a demo just to assure whether it is useful for you or not. How much I need to spend? We (Simplylearnt.com) do not encourage to waste money on anything which is not at all useful for you. Hence, You can first explore the website(for any specific exam) completely. Take a demo of the study material and when you feel it is worth spending money on, Then only check out the price(which is absolutely affordable). Go through all these points to get success in your Engineering, Medical, NTSE & CAT exams.